KIGALI, Jun 23 2014 (IPS) - Before Rwanda’s 1994 genocide, Salaam Uwamariya’s husband, a professor, was the family breadwinner, providing for her and their eight children. Uwamariya sold vegetables at a nearby market to supplement their income. But like many in this Central African nation, her life changed in just the 100 days starting in April 1994 when close to a million Tutsis and moderate Hutus were killed. Among the dead were her husband and her two eldest children. But Uwamariya has been able to slowly rebuild her life by making clothes that are sold locally and overseas and which have also even been shown on African catwalks. Today, thanks to Centre César, a community centre which in 2005 “adopted” her village of Avega in Kimironko, near Kigali, the country’s capital, Uwamariya has learned new skills and is able to support her family. “I lost my family, a lot of materials, my house, everything,” she tells IPS in the local Kinyarwanda language. She also lost her parents, aunts and uncles in the genocide. Avega is made up of 150 houses and has a population of 750. With financial support from Canadian charity Ubuntu Edmonton, the centre runs training sessions for residents whose lives have been scarred by genocide. Classes here include courses in mechanics and silk screening. There is also a school sponsorship programme and daycare centre and a sewing shop where Uwamariya works. Over 85 people are said to pass through the doors of Centre César and benefit from their services every week. “[Sewing] has improved my life a lot because I get some revenue from it. It improves my life and the lives of my children,” says Uwamariya, who says she earns up to 3,000 Rwandan Francs (4.44 dollars) for making one dress, which she says takes no more than two days. All sewers are paid a fair trade wage, with the money going directly to the women. Using industrial machines, members of the centre have been taught to sew by Edison Hategekimana, one of the centre’s two master tailors and the only man here. He taught Uwamariya over a year, but she says it “wasn’t challenging”. On any given day up to 20 women, including Uwamariya, 58, are packed into a room working laboriously on dresses, jackets, pants, bags, aprons and pyjamas bags and jewellery in bold African prints. Many of the items they tirelessly piece together are the creations of upcoming Rwandan fashion designer Colombe Ndutiye Ituze. Strangely enough it was an international counterpart, Canadian Johanne St. Louis, who pointed out the local talent available to help Ituze. The pair met at the Rwanda Fashion Festival 2010. St. Louis is the CEO of St. Louis Fashion and Dreamyz Loungewear. Ituze launched her INCO Icyusa label, one of Rwanda’s first fashion houses, in 2011. “I really loved her clothes and I asked her where do you get things done and she told me they were made by these women [at Centre César],” Ituze tells IPS. 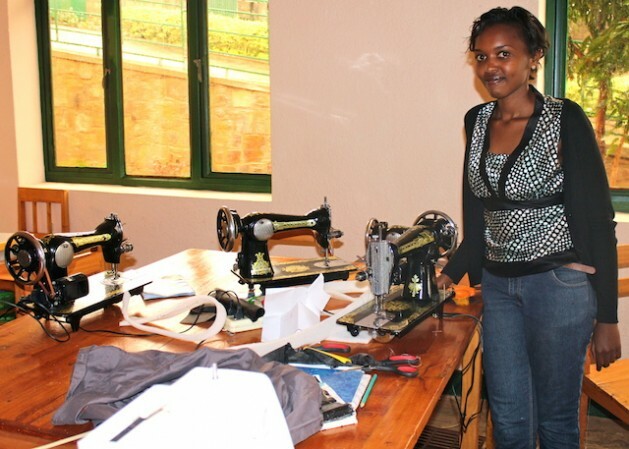 When Ituze discovered the centre, she said many of its members possessed basic sewing skills. St. Louis had trained some, and those she trained taught others. “The first time I came here they were good, but not as good as they are now. They’re improving all the time,” says Ituze. Today the clothes that Uwamariya and her colleagues stitch together are sold in Ituze’s store in Nziza, Kigali. St Louis sells pieces in her clothing store in her house in Cannington, about 110 km outside Toronto. This may happen sooner rather than later, with Ituze and St.Louis talking to more international stores about stocking their designs. Together they opened DODA Fashion House last September. Doda means, “to sew” in Kinyarwanda. They have a workshop in Kimironko, Kigali, which will eventually employ four fulltime staff and the plan to hire an additional 14 women to begin training and creating products. In the next five years their workshop will hopefully offer training courses in commercial sewing, design, sewing machine mechanics and marketing. It’s a huge step for the industry in tiny Rwanda, which doesn’t have a fashion school. Meanwhile, back at Centre César, its supervisor Alain Rushayidi tells IPS he will only be truly satisfied when the charity is able to transfer its ownership to the people of Avega. “This centre has to become their centre. In 10 or 15 years this will belong to the members, all of them,” he says. Rushayidi says a structure to help the centre become sustainable and financially independent is currently being implemented. “I can’t explain the challenges before we started [the centre],” Rushayidi says.